When one uses sewing to incorporate a line on a fabric, it is much more labor-intensive than simply drawing a line with ink and yet women have embroidered fabric for ages… is it because of the more permanent aspect of it? That even if the colors were to run, the embroidery will adhere no matter how delicate, it will remain, worn and steady? What’s ironic is that this craft whose origin was in the Mughal world, Persia, was lovingly embraced and utilized in craftsmanship done for themes originating in Hinduism. Something to think about in the current climate of India where there are fundamentalist leaders proposing to change the name of the Taj Mahal, built by Muslim rulers! My works often resort to the use of text and symbol, calligraphy, popular icons, etcetera, to register a context to the viewer. In most of my performance art still photographs, my face becomes a canvas representing the topic of address. The combination of the two converts the image into a metaphor – taking away the literal meaning of the words and the obviousness of self-representation. The Arabic script spelling “Allah” or the Hindi “Om” may not be legible to all, but the significance of wearing a dot or design in between the eyebrows is known to most. 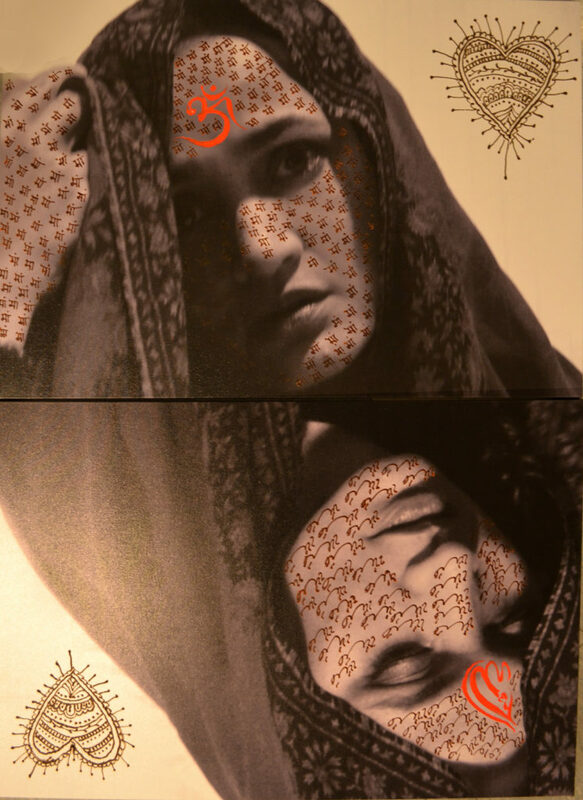 the Arabic script spelling “mother” tattooed across the face of the Allah denoted woman or the Hindi script spelling “mother” tattooed across the face of the Hinduism denoted woman may not be legible to all, but what almost everyone is able to perceive is the resonance of the images to the queen of hearts configuration. And what most might also easily guess is the opposite nature of the two faces… despite the fact that they belong to one and the same person! For those who are aware of the polarized socio-political climate of India, no further explanation is necessary. For those unaware – the story is still about the symbolic motherland separated ideologically but with common challenges. “The best thing about a picture is that it never changes, even when the people on it do” the words of Warhol who made it his life’s mission to render faces, mostly those of famous people. This face enacts a few raw emotions, those that may be placed in the category of play acting with props, placements, the whole nine yards. The depth of feelings are easier to enact when done deliberately. In reality one opts for a coping mechanism that can very easily mask the depth of expression. And as Warhol says, the people in pictures always change.